Yellow learning diaries and reading books must be in school every day. The children are encouraged to bring these home to record their learning each night. We usually change the children's reading books every Thursday, but please make sure your child has their reading book with them every day. Daily reading points are given for reads and also talking about what the children have read. Reading points are celebrated on the charts in our classroom and children are rewarded for reading with certificates and prizes. Congratulations Chelsea! Great work in Maths this week, you perservered and made great progress. Keep up the good work! 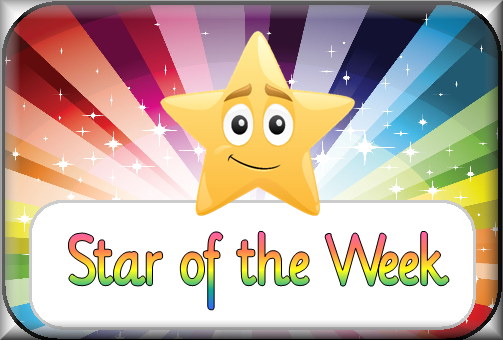 I wonder who will be star of the week next week? Our PE day this term is Thursday, but please bring your PE to school everyday. Our topic this term is called "Healthy Me". We will be updating our Class webpage with information about our topic and all the fun activities we have planned! We are looking forward to going to Frankie and Bennys on Tuesday 27th September, where we will be learning all about food preparation and making a healthy pizza. Yummy! There are lots of ways you can help your child to learn at home. Spelling, Punctuation and Grammar games for you to play with your child at home. Top Tip: Repeat what your child has described back to them and then ask for an additional adjective to help you work out what the object is like, e.g. 'What does it feel like? Play 'Crazy Adverbs' – one person is given a verb and adverb to act out, e.g. 'dance gracefully', 'spin quickly'. The aim is for the actor to dance/spin in such a way that others can guess what the adverb is. It might be worth modeling this game for your child by taking the first turn at being the 'actor'.